A very profitable Dunkin Donuts Baskin Robbins Restaurant is for sale in Michigan. 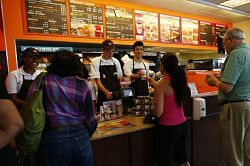 It is fully remodeled and is up to the latest Dunkin standards. It has a Drive Thru, is a 24 hours store and it does not require baking on premises as it is part of a central kitchen making it easy to operate. Great for someone new to the Dunkin Brands System that wants to purchase a single store. Very rarely is a single Dunkin location sold, therefore this makes it very easy for a new franchisee to join the #1 Coffee/ Ice Cream Franchise in the world! If you are looking for stability and profitability, this is the opportunity for you. Must have experience in owning, operating or managing restaurants. To find out more about this Dunkin Donuts location please fill out the form below and submit.